Jeremy Torz, Steven Macatonia. Union Hand-Roasted Coffee, UK. Locked away at the heart of East Africa, Rwanda is a tiny country about the size of Wales with a rural, subsistence-agricultural economy. With a population of 9.3 million people, land is divided into small family plots with no or very little large-scale commercial agriculture. In recent years, the country’s coffee sector has undergone a remarkable transformation unlike any other coffee producer. It has seen the establishment of a now-vibrant grower and export community dedicated to working with the speciality sector. Although Rwanda had been producing commercial coffee since the early 1900’s, the majority production was purchased by the state-owned RWANDEX and exported as Rwanda Ordinaire. This product was usually below C market due to the general perceived lack of fine cup quality and consistency. This situation was exacerbated after the 1994 civil war, when the entire country’s social and economic infrastructure broke down, displacing the population and condemning even greater numbers of people to poverty and subsistence. Our own journey through this country, its coffee and in reality its reformation to producer of premium speciality really began just a few years later. In 2001, a fledgling development programme brought us together with the first newly constituted Co-operative, Abahuzamugambi Ba Kawa to form a relationship that has lasted to this day. The Co-operative started life as an association of small farmers in 1999 in the Maraba district (now called Huye). It’s purpose was to present a single voice to RWANDEX and sell coffee at a collectively agreed price in excess of the low prices often paid by rural collectors. Around this time, the USAID funded development programme, Project to Enhance Agriculture through Linkages (PEARL) was also active in this area. PEARL—directed by Dr Tim Schilling—was putting a remit into action to produce smallholder, fully-washed coffee optimised for quality, not volume. With this support from USAID as well as OCIRCafé (the coffee department of the government industrial development agency), a new model was created for coffee farming and specifically the centralised post-harvest processing into exportable beans under an economically sustainable model. To bring the project to life, Abahuzamugambi Ba Kawa (based near the small town of Butare and close to the National University of Rwanda campus) was selected for the pilot project which could be developed as a model cooperative to mentor other communities. Agronomy Extension workers focused on creating, training and developing farmers’ understanding of better crop care to improve quality. In 2001, the critical turning point in developing cup quality was the construction of the first coffee washing station (CWS) in recent years. Previously, all coffee cherries were processed to parchment by hand —pounding with stones, using home made wooden pulpers in front of the home or through the use of manual pulpers provided by OCIR Café located around the countryside. Because washing water had to be collected from streams up to an hour or more walk away, washing and cleaning was a haphazard activity. The crop further suffered from an inherent regional potato taste defect: a starchy, astringent and pungent flavour that seemed to appear randomly throughout the crop. The centralised CWS thus took the task of processing the cherries out of the hands of the individual farmers, who previously sold parchment coffee at low prices to intermediaries. Instead, farmers would now sell perfect, ripe cherries to the CWS at a premium with the lesser quality crop sold through traditional commodity channel. Quality was further increased as the project agronomists trained workers to understand the post-harvest production techniques. Through this training and implementation of controlled separation and grading, a notably and dramatic reduction in potato taste became apparent. During the time the first CWS was constructed, we become aware of the PEARL Project in Rwanda. We also heard that the country had retained cultivation of the traditional Red Bourbon varietal, and that it might be interesting to look at the coffee from this previously non-speciality producer. After making contact with Dr Schilling we received carefully-graded and prepared samples from smallholder households. Our cupping determined that although variable, there was a flavour profile that was exciting and distinct from the other East African origins in the better lots. The coffee was outstandingly sweet, with an underlying milk chocolate component, and vibrant, but controlled citric acidity, possibly softer and more rounded than other coffees of the region. In 2002 we visited Abahuzamugambi Ba Kawa to meet the leaders to understand how we could work to support their efforts. We began to receive crop samples direct from the new CWS and cupped daily lots to select grades achieving speciality status. A contract was agreed for the resulting green coffee from the first managed production of Fully Washed Rwanda Arabica, the world’s first to market as Rwanda Bourbon single origin, under it’s new, speciality philosophy. Between 2002-2004, we began to change the focus from volume production to a strategy of developing capacity to produce quality coffee. We launched a marketing programme to attract buyers to this fledgling specialty origin. Those bold enough to take up the challenge worked closely with their chosen washing stations to select lots of a consistently high standard. If Rwanda coffee exports were to be a commercial success, this lot selection needed to be undertaken in-country. In November 2003, Coffee Corps (USA) sent the first cupping trainers to construct and deliver a formal Cupper Training Programme to develop this expertise. Previously, all technical training had been solely concerned with raising “overall quality”; but a successful future for Rwanda coffee depended upon its being able to exploit its regional microclimates. Over the following 3 years, significant progress was made in coffee quality and technical skills. With over 100 CWS in operation, the strategy was to bring the Cup of Excellence to Rwanda and to use this spotlight to facilitate additional buyer relationships. Before this could be agreed, a pre-cursor competition—the 2007 Golden Cup—facilitated by the SPREAD programme and Rwandan coffee industry, was held to trial the logistics of selecting traceable lots and working to an international protocol. Coffee farmers worked to produce exemplary coffees for this internal competition. 24 diverse and exceptional coffees were selected to represent Rwanda’s top coffee production zones. Do these exemplary coffees from different regions within Rwanda offer a sufficiently diverse spectrum of flavours to offer points of difference? Can these flavours be correlated to particular geographic variables and be further used to direct farmer activities? The coffee selected from Golden Cup and CoE were used as the analytical samples in an extensive sensory analysis conducted by Songer Associates and volunteers from CoE jury panels. Samples from each of 8 different geographical regions were repeatedly cupped for consistently identifiable flavour characteristics. If these were not present in multiple samples from the region, the attribute was discounted. Through this protocol a list of attributes and identifiers was compiled that would ultimately represent three consistent “appellations”. With the SPREAD Project’s links to the National University of Rwanda, a collaboration was established with research by Dr. Michele Schilling (Director of Geographic Information Systems Research Centre) on soil types and geographical profiling to create a link between appellation territory and the observed flavour attributes. Since the first Fully Washed coffees were developed in Rwanda, there has been consensus amongst specialty buyers that there is indeed a distinct flavour profile present within Rwanda coffee. This has most often been noted as the presence of soft citrus, slightly floral, with pleasant milk chocolate mid palette notes. It’s balanced and sweet, making it extremely versatile for filter (drip) and espresso with the appropriate roast. Paul Songer further notes one distinctive finding, that there were often unique “mouth-feel” aspects to Rwanda coffee which some described as “soft” or “silky”. This is important to note as an especially original attribute, when compared to the other fine quality East African coffees. Much of this taste profile may be attributed to the Red Bourbon varietal which exclusively dominated cultivation until 1999 with the first releases of Catuai and Caturra varietal by OCIR Café and ISAR (Institute for Science in Agricultural Research). 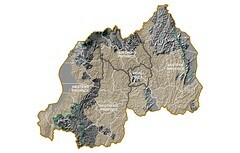 Of the two, Caturra was found to be more popular but is estimated to be less than 2% of Rwanda production. Unverified anecdotal evidence is that the Rwanda Caturra originated from Kenya, with similar characteristics to a population derived from a Jamaica Blue Mountain varietal that produces a Bourbon-like plant type. It is believed that some Bourbon derivatives such as Jackson from the 1940’s or 50’s may have been present but these have low productivity and are very rust susceptible. They have since been replaced over time with newer Bourbon strains, with higher productivity and improved disease resistance. According to Tim Schilling, “before the PEARL project, Rwanda producers were unaware of the specialness and desire of roasters to seek the Bourbon varietal they were producing, it was just coffee. We have been able to put Bourbon’s name on a pedestal and relate it to Rwanda, it’s a very positive thing for the country to hold onto”. 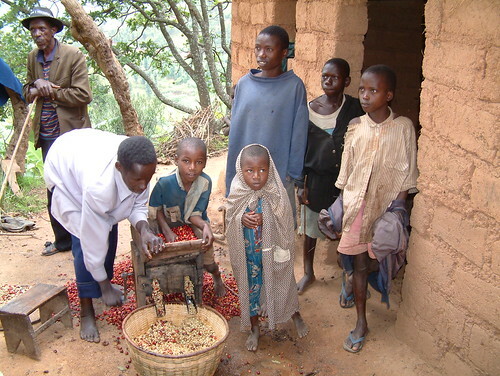 Between 2003-2005, Rwanda started to release Pop & Harrar as two new varieties with seeds supplied through OCIR Café. It is up to the farmer to select which variety they choose to grow, and are not currently selecting specific varieties according to region. The cupping analysis that follows was performed to identify attributes by region and not varietal. The analytical cupping work is refining the flavour map of Rwanda coffee and has identified candidate samples that displayed consistent and unique flavour profiles for appellation designation; Northern Region, Central Kivu and North Huye Region. The North region sample was the winner of the Golden Cup Competition and was one of the most complex samples analysed, with 33 flavour attributes found. Beside aromatics that included nuts, spices, fruits and flowers, the sweetness and phosphoric acid components were amongst the highest intensities of any in the set of samples. It also had several descriptors applied to the mouthfeel and the cleanest, sweetest and longest finishes of the set of samples. The Central Kivu sample was also noted for its floral and fruit characteristics, including lime and a small amount of violet fragrance. The mouthfeel of the sample produced several descriptors, indicating that it was an important aspect of the sample. The finish was clean, fruit-like and of medium length. North Huye samples have some unique flavour and aromatic qualities, most notably including black fruit (blackcurrant fragrance and flavour, blackberry flavour, black cherry flavour) a unique mouthfeel described as “mouth-coating” and “syrupy”, and a medium long sweet finish. At this current stage of work, the other regions studied did not provide the panellists with a strong consensus of around 5 or 6 attributes, usually required to define a coffee’s character. “With Rwanda we’ve been hard pushed to keep it to that level, usually its 12 or so”, commented Paul Songer. The attributes were not sufficiently consistent or unique in their cup profiles when compared region to region to apply appellation designation. North Region cup profile was characterized by floral aromatics, heavy black fruit (blackcurrant, prunes) and phosphoric acid. Central Kivu cup profile demonstrated more red fruit (red apple, cherry) and dominated by malic acid (apple-type acidity). The coffees also consistently showed attributes of lemon/lime flavour and apricot. North Huye Region has floral aromatics, with flavour attributes of red cherry, with less heavy black fruit notes, black cherry, blackcurrant and citric notes of grapefruit and orange. Rwanda’s coffee industry has made a spectacular journey since 2001 possibly more than any other producing country in developing and understanding what added-value (speciality) buyers are seeking. The project is at the early stages of developing an appellation designation which is the capacity to reproduce defined flavour profiles, unique to a region, with reasonable consistency. Once this has been achieved the next stage will be to uphold and safeguard the standards of the appellation. To achieve this requires good process control (picking, fermentation, drying, and milling) provided by good technical assistance and extension services to farmers. Variation at this level can amount to such capriciousness that could overwhelm regional differences in many cases. So the first stage has to be solid post-harvest control and then with appellation development achieving a basic level of consistency and it is encouraging to note that the level of achievement to date is significant with a professional national cuppers employed by most CWS and co-operatives. Out of this work, the impact will be in the development, marketing and eventually consumer awareness of regional flavour characteristics – leading to the creation and protection of geographic appellations. This can make a huge difference in the economic development of a coffee producing country as well as bring more excitement and curiosity to the marketplace. With grateful thanks to Paul V. Songer (Songer Associates Inc, Boulder Colorado. USA.) and Dr Timothy Schilling, Director for Enterprise Development and Partnerships, The Borlaug Institute, Texas, USA, for interviews and published materials.